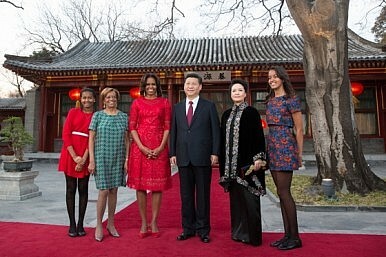 The First Lady’s trip to China provided a high-profile, low-controversy example of U.S.-China relations. Michelle Obama’s trip to China wrapped up yesterday after a week of touring some of China’s most famous sites. The First Lady, daughters Malia and Sasha, and mother Marian Robinson visited Beijing’s Forbidden City and Summer Palace as well as the Great Wall, the Terra Cotta Warriors in Xi’an, and the Chengdu Panda Base. While no one would argue the trip had serious political implications, it was an obvious diplomatic gesture from the U.S. to China—especially given that Michelle Obama had declined to travel to California to meet with Xi Jinping’s wife Peng Liyuan last summer. Especially when it comes to leaders and their families, symbolism matters in diplomacy, and having the First Lady write effusive blog entries about China’s history and culture was an easy way for the White House to try to drum up some goodwill in China. In addition to her sight-seeing, though, Mrs. Obama also had a more serious agenda. According to the special White House website set up to promote her trip, her trip was focused “on the power and importance of education.” Accordingly, she visited Chinese schools, such as Beijing Normal School and Chengdu No. 7 High School, as well as the Stanford Center at Peking University. She also hosted a roundtable on education. Many of Mrs. Obama’s comments focused on her goal of promoting equal access to education for all. In this regard, the First Lady’s theme fits well with the passions of Peng Liyuan, who was herself just named a UNESCO Special Envoy for the Advancement of Girls’ and Women’s Education. In her travel journal, Mrs. Obama praised study abroad programs, both as a way to equip students for jobs, and as a way to invest in U.S.-China relations. “By studying abroad, and getting to understand cultures and societies different from your own, you can begin to lay the foundation for that kind of cooperation,” she wrote. New U.S. Ambassador to China Max Baucus has also marked people-to-people exchanges (including educational exchange) as a top priority for U.S.-China relations, signalling U.S. commitment to the softer side of diplomacy. These comments were simply ignored by Chinese media outlets, but did stir up some controversy on social media. After her speech at Peking University, Professor Kong Qingdong (famous as an outspoken pro-Communist Party, anti-American voice on China’s microblog) posted a fake story rebutting Mrs. Obama’s praise of U.S. freedoms. According to Tea Leaf Nation, Kong posted: “A female student stood up and asked [Obama], ‘Isn’t the United States strong because its intelligence agency is listening to the voice of its people? What exactly is the difference between listening and monitoring?’” Though the rumor was easily debunked (and a number of responding netizens did so), many of Kong’s supporters said the logic of the question remained valid, and demonstrated the hypocrisy of U.S. support for human rights. Despite the social media comments, the First Lady largely succeeded in keeping her trip pleasant and politics-free. As s the New York Times wrote, compared to earlier trips by U.S. First Ladies, Michelle Obama’s visit to China was designed to be politically tame. In 1995, Hillary Clinton famously used a speech on women’s rights to denounce China’s human rights record. In 2008, Laura Bush visited a refugee camp in Thailand for citizens who had fled political oppression in Myanmar—a visit China condemned, partly because of its own support for the Myanmar regime. By contrast, Michelle Obama’s visit with her family was supposed to provide photographs of the First Family enjoying Chinese landmarks and media soundbites about the bright future of U.S. and Chinese students. In that regard, it succeeded.